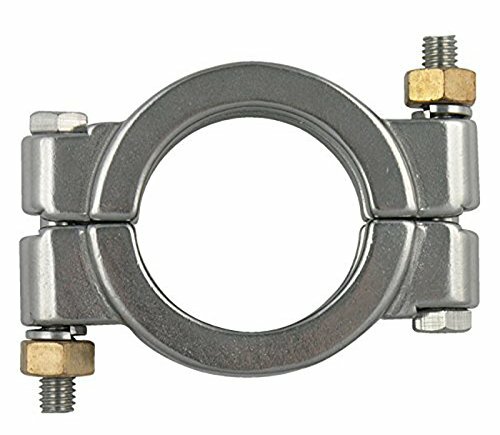 M5 1/4 Inch 304 Stainless Steel U-Shape Bolt Clamps Cable Wire Rope Clips 6PCSCategory: 304 Bolted ClampMade from 304 stainless steel?for?corrosion resistance and durability.Designed to couple together two lengths of wire rope, or to form an eye or loop on wire rope.Consists of a U-shaped bolt, a forged saddle and two nuts.The two layers of wire rope are placed in the U-bolt and clamped into place for a tight connection. ?For CALIFORNIA residents only: WARNING: This product contains chemicals including DEHP, which is known to the State of California to cause cancer and birth defects or other reproductive harm.Please note that by posting this Proposition 65 warning, we are notifying you that one or more of the Proposition 65 listed chemicals may be present in a product. With Unique Bargains' products, the exposure to these chemicals may be of no significant risk to you, but out of caution, we have elected to place this warning on our site to make sure our customers are informed.You can find more information at http://www.oehha.ca.gov/proposition-65/about-proposition-3112. M2 304 Stainless Steel U-Shape Bolt Saddle Clamp Cable Wire Rope Clip 2PCSCategory: 304 Bolted ClampMade from 304 stainless steel?for?corrosion resistance and durability.Designed to couple together two lengths of wire rope, or to form an eye or loop on wire rope.Consists of a U-shaped bolt, a forged saddle and two nuts.The two layers of wire rope are placed in the U-bolt and clamped into place for a tight connection.For CALIFORNIA residents only: WARNING: This product contains chemicals including DEHP, which is known to the State of California to cause cancer and birth defects or other reproductive harm.Please note that by posting this Proposition 65 warning, we are notifying you that one or more of the Proposition 65 listed chemicals may be present in a product. With Unique Bargains' products, the exposure to these chemicals may be of no significant risk to you, but out of caution, we have elected to place this warning on our site to make sure our customers are informed.You can find more information at http://www.oehha.ca.gov/proposition-65/about-proposition-65. M14 304 Stainless Steel U-Shape Bolt Saddle Clamp Cable Wire Rope ClipCategory: 304 Bolted ClampMade from 304 stainless steel?for?corrosion resistance and durability.Designed to couple together two lengths of wire rope, or to form an eye or loop on wire rope.Consists of a U-shaped bolt, a forged saddle and two nuts.The two layers of wire rope are placed in the U-bolt and clamped into place for a tight connection.For CALIFORNIA residents only: WARNING: This product contains chemicals including DEHP, which is known to the State of California to cause cancer and birth defects or other reproductive harm.Please note that by posting this Proposition 65 warning, we are notifying you that one or more of the Proposition 65 listed chemicals may be present in a product. With Unique Bargains' products, the exposure to these chemicals may be of no significant risk to you, but out of caution, we have elected to place this warning on our site to make sure our customers are informed.You can find more information at http://www.oehha.ca.gov/proposition-65/about-proposition-65. 20x Premium 304 Stainless Steel T-Bolt Turbo Silicone Hose Clamp 4" 102-110mmCategory: 304 Bolted Clamp20x Stainless Steel Premium 304 T-Bolt Turbo Silicone Hose Clamp 4.02"-4.33". 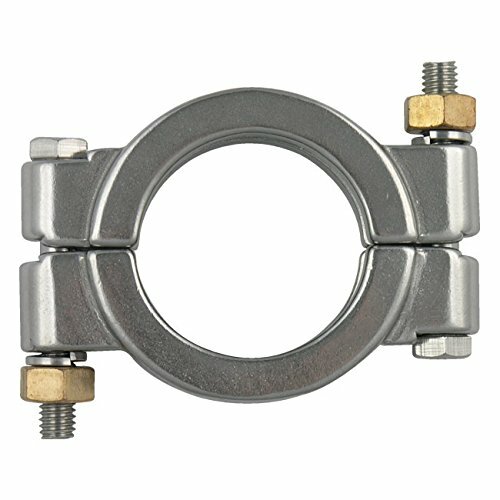 Heavy Duty Premium 304 Stainless Steel T-Bolt Hose Clamps. These premium, heavy duty T-Bolt Hose Clamps have been designed tough and made from the highest quality materials. We use the finest premium quality 304 stainless steel that is super strong and rust resistant. Clamps work great for many applications (for either industrial or home use) such as commercial, automotive, air intake systems, duct systems and coolant systems. Product is backed by a no-hassle One Year Guarantee against defects. Set includes: Complete set includes TWENTY new, never used premium stainless steel T-bolt hose clamps (including galvanized steel bolt and nut hardware). Clamp Diameter (inner diameter): 102mm - 110mm (4.02"-4.33"). Band Width: 19mm (3/4"). Thickness: 0.8mm material thickness. Strong, rust and weather resistant premium 304 stainless steel (compare to others selling cheaper grade 201 or 301 steel). Durable and tough, ready to handle tough environments and heavy duty applications. One Year Guarantee against workmanship and defects. 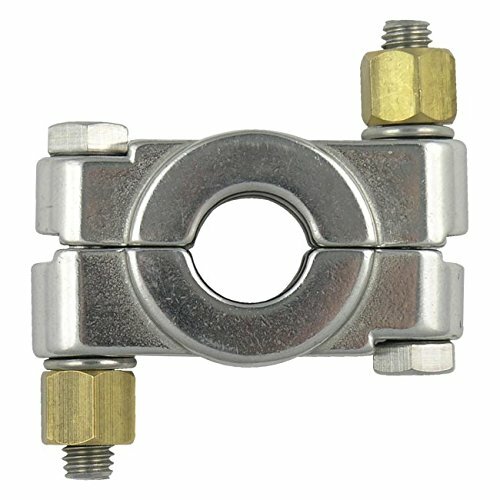 M6 1/4 Inch 304 Stainless Steel Saddle Clamps Cable Wire Rope Clips 8PCSCategory: 304 Bolted ClampMade from 304 stainless steel?for?corrosion resistance and durability.Designed to couple together two lengths of wire rope, or to form an eye or loop on wire rope.Consists of a U-shaped bolt, a forged saddle and two nuts.The two layers of wire rope are placed in the U-bolt and clamped into place for a tight connection. ?For CALIFORNIA residents only: WARNING: This product contains chemicals including DEHP, which is known to the State of California to cause cancer and birth defects or other reproductive harm.Please note that by posting this Proposition 65 warning, we are notifying you that one or more of the Proposition 65 listed chemicals may be present in a product. With Unique Bargains' products, the exposure to these chemicals may be of no significant risk to you, but out of caution, we have elected to place this warning on our site to make sure our customers are informed.You can find more information at http://www.oehha.ca.gov/proposition-65/about-proposition-4498. 20x Premium 304 Stainless Steel T-Bolt Turbo Silicone Hose Clamp 1.75" 45-50mmCategory: 304 Bolted Clamp20x Stainless Steel Premium 304 T-Bolt Turbo Silicone Hose Clamp 1.77"-1.97". 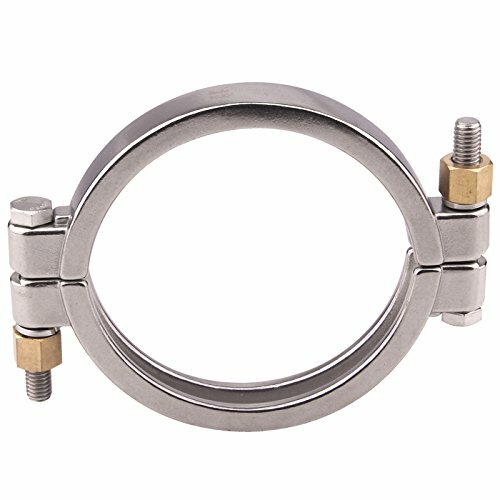 Heavy Duty Premium 304 Stainless Steel T-Bolt Hose Clamps. These premium, heavy duty T-Bolt Hose Clamps have been designed tough and made from the highest quality materials. We use the finest premium quality 304 stainless steel that is super strong and rust resistant. Clamps work great for many applications (for either industrial or home use) such as commercial, automotive, air intake systems, duct systems and coolant systems. Product is backed by a no-hassle One Year Guarantee against defects. Set includes: Complete set includes TWENTY new, never used premium stainless steel T-bolt hose clamps (including galvanized steel bolt and nut hardware). 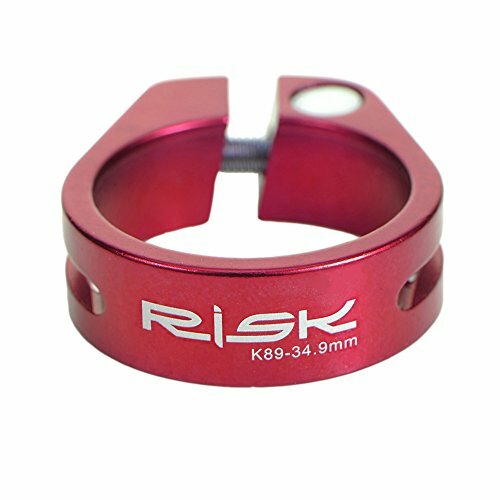 Clamp Diameter (inner diameter): 45mm - 50mm (1.77"-1.97"). 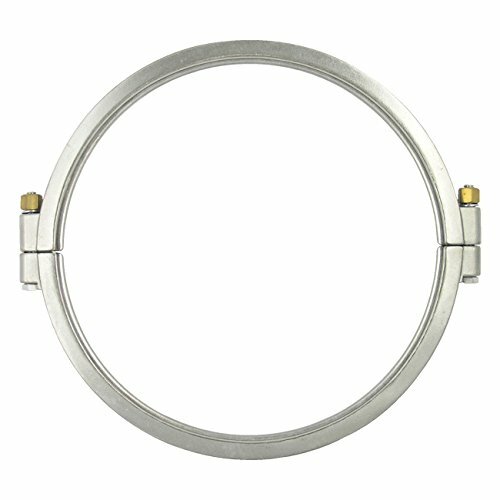 Band Width: 19mm (3/4"). Thickness: 0.8mm material thickness. Strong, rust and weather resistant premium 304 stainless steel (compare to others selling cheaper grade 201 or 301 steel). Durable and tough, ready to handle tough environments and heavy duty applications. One Year Guarantee against workmanship and defects. 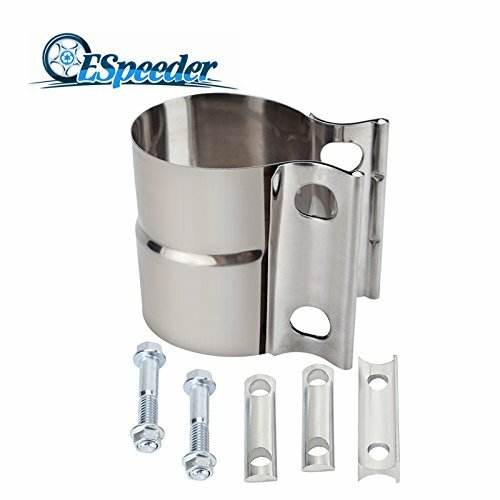 M5 304 Stainless Steel Two Hole Pipe Straps Tension Tube Clip Clamp 15pcsCategory: 304 Bolted ClampMade from 304 stainless steel.Designed with two mount holes.Used?to secure rigid?conduit to wood, masonry or similar surfaces.Easy to mount by screws,?but mounting screws are not included.For CALIFORNIA residents only: WARNING: This product contains chemicals including DEHP, which is known to the State of California to cause cancer and birth defects or other reproductive harm.Please note that by posting this Proposition 65 warning, we are notifying you that one or more of the Proposition 65 listed chemicals may be present in a product. With Unique Bargains' products, the exposure to these chemicals may be of no significant risk to you, but out of caution, we have elected to place this warning on our site to make sure our customers are informed.You can find more information at http://www.oehha.ca.gov/proposition-65/about-proposition-65. Learn the correct steps to install a Double Bolt Clamp with saddles in this procedure video.